With Peter Jackson’s The Hobbit: An Unexpected Journey releasing in just a couple of months (squee! ), you can expect the marketing machine to begin steamrolling audiences starting…now! 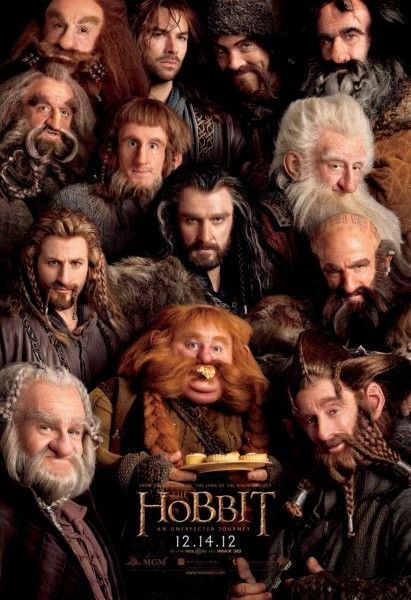 Just yesterday we brought you this fantastic Dwarf-centric poster for the film. Today, we stick with the Dwarves but instead of stacking them together unceremoniously, this new banner poster gives each of them their fair share of elbow room. The Hobbit: An Unexpected Journey stars Martin Freeman, Ian McKellen, Richard Armitage, Peter Hambleton, John Callen, Ken Stott, Graham McTavish, James Nesbitt, William Kircher, Aidan Turner, Dean O’Gorman, Mark Hadlow, Jed Brophy, Adam Brown and Stephen Hunter and opens December 14th, 2012. Hit the jump to check out the banner poster.